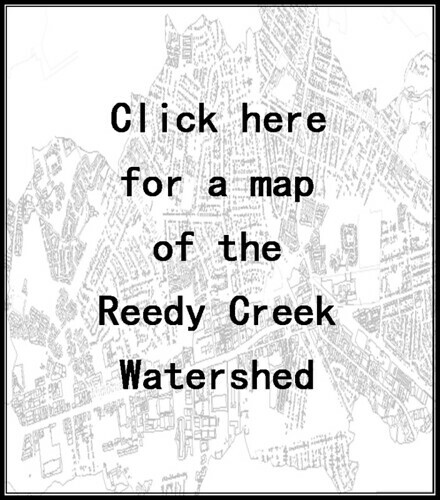 During March and April of 2012, water quality monitors with the Reedy Creek Coalition (RCC) identified foul odors and elevated E. coli counts at a monitoring site on Crooked Branch, a tributary of Reedy Creek. The RCC notified the City of Richmond’s Department of Public Utilities (DPU) regarding their observations and the DPU Pretreatment Program began an investigation on April 25, 2012. Environmental Technicians with DPU’s Pretreatment Program took water samples from the outfall where Crooked Branch daylights at Crutchfield Streetand submitted them to the Richmond Wastewater Treatment Plant Laboratory for analysis. The Technicians also noted a foul, sewage-like odor, and turbid water at the outfall. The results of the samples were reported by the lab on April 30th and confirmed the findings of the RCC volunteers, indicating E. coli levels of 435 MPN (most probable number )/100 mL (milliliters) and ammonia of 0.8 mg/L (milligrams per Litre). The investigating Technicians returned to the site and began to trace the contamination upstream using a system map and a handheld YSI Professional Series meter with conductivity, pH (a measurement of acidity), ammonium, and DO (dissolved oxygen) probes. Concentrations of ammonium were observed to be as high as 2.2 mg/L at a manhole near Midlothian Turnpike and a strong sewage odor was detected. The next accessible manhole was on Brandon St, westof Belt Boulevard, where a strong sewage odor was noted but ammonium concentrations were found to be less than 1.0 mg/L. The investigators then proceeded to open manholes on the sanitary sewer line adjacent to the storm sewer and discovered that the sanitary line appeared to be significantly blocked and sewage was backed up in the line. The investigators notified DPU Sewer Maintenance personnel regarding the backup and a crew was dispatched on May 1st to address the problem. On May 3rd the investigating Technicians returned to the Crooked Branch outfall and noted that there were no foul odors detectable and that the water appeared to be much less turbid. Follow up sampling showed E. coli levels of 56 MPN/100 mL and ammonia concentrations of less than 0.1 mg/L at the outfall. 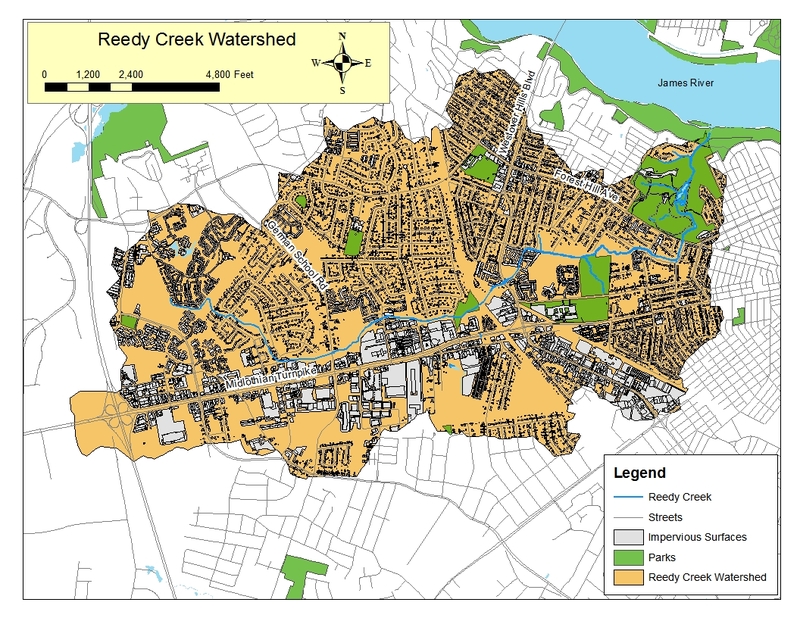 The correction of this issue means that significantly less bacteria and nutrients are now entering Reedy Creek through Crooked Branch. The success of this investigation also serves to highlight the benefits for water quality that can be achieved when the City and citizen groups work together to identify and address the problems facing our local waterways. Great work! Thanks for your tireless labor! Awesome work! Thanks for this post. 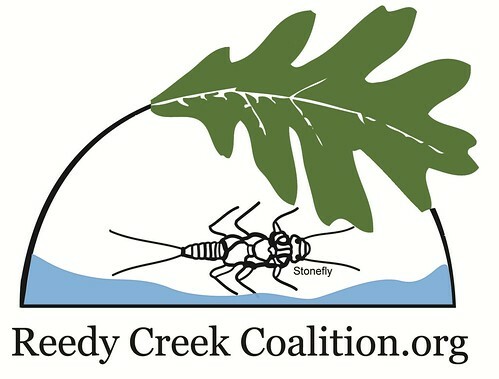 Way to go Reedy Creek Coalition!!! Just saw this post and am deeply impressed with the effective and tireless work that RCC has been doing over the past decade, and still going. It’s the volunteer spirit and dedication that keeps our community vibrant and healthy. Thank you, RCC!